Happy Monday everyone! 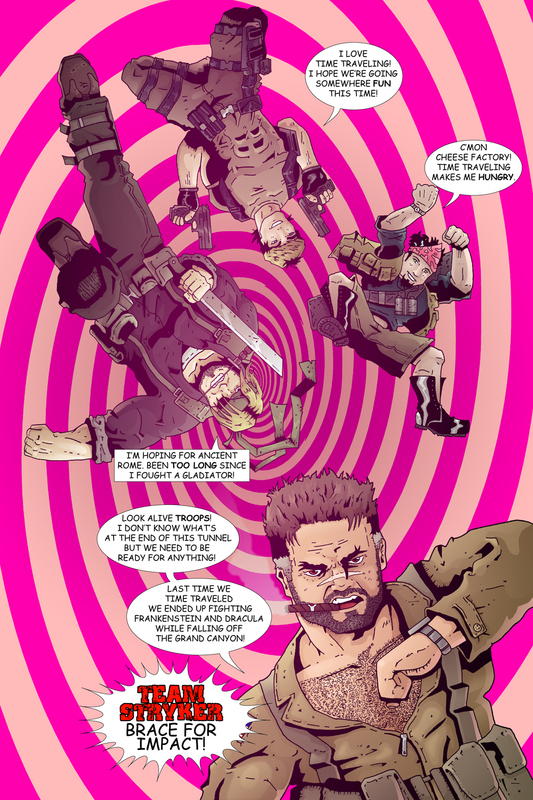 I thought I would help kick start your week with a bang so here’s the first page to Team Stryker Mission 003! This issue doesn’t mess around as it starts right in the thick of things with Team Stryker falling through time! With Team Stryker, anything can happen and I wanted to establish that right off the bat with this issue. My theory is once you add the possibility of time travel into your universe there really isn’t anywhere you can’t go and I want to be able to go wherever TS takes me. The pencils for this page were drawn waaaaaaaaaaaaay back in 2009 but I never had a chance to give it the colors it deserves until now. When I started working on this issue I was working full time at a small video game company. I was drawing at work for 8-10 hours a day and it became really hard to come home after that and want to draw more. Now that I’m free from that job I’m able to focus all my artistic talent on bringing Team Stryker to life on your computers! Have a great start to the week and don’t miss out on Thursday’s page!